For introductory courses in phlebotomy. 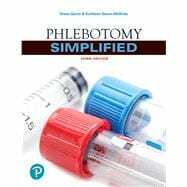 Phlebotomy Simplified is a step¿-by-¿step, practice-¿oriented approach to blood collection procedures for the beginning health care student. It can also serve as a practical reference guide for health care professionals responsible for blood and specimen collection in diverse settings, including hospitals, ambulatory clinics, home health care, and pediatric clinics. The 3rd edition has been reconfigured to make student learning objectives a more direct extension of the entry-level competencies of the National Accrediting Committee for Clinical Laboratory Sciences (NAACLS). Diana Garza received her Bachelor of Science degree in Biology from Vanderbilt University in Nashville, Tennessee, and completed her Medical Laboratory Science certification requirements at Vanderbilt University Medical Center. Her interest in laboratory sciences and in teaching led her to a Master of Science in Education at the Peabody School of Vanderbilt University. She received her Doctorate of Education in Allied Health Education and Administration through a collaborative graduate program of the Baylor College of Medicine at the University of Houston. Dr. Garza’s laboratory and teaching experience continued at the University of Texas Health Science Center at Houston and, for many years, at the Microbiology Laboratory at the University of Texas M. D. Anderson Cancer Center, where she later became the Administrative Director of the Division of Laboratory Medicine. In 1990, Dr. Garza joined the faculty of Texas Woman’s University—Houston Center, where she taught Internet-based quality improvement courses and became editor of several journals and continuing education publications. Dr. Garza has served on numerous health care advisory boards, as a board member for many nonprofit health care organizations, and on nationwide committees in the field of laboratory medicine. She continues her writing and editorial pursuits primarily in the field of phlebotomy.